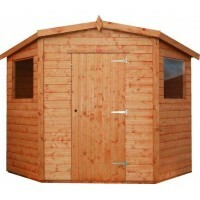 TJ's garden sheds, summer houses and children's playhouses are made with the highest quality timber and the PRICES INCLUDE FITTING within a specified radius*. Whether you need additional storage with a garden shed, or you are looking to make the most of your garden by installing a Summerhouse or wanting to create a magical world for the children TJ's have a variety of options available to suit your needs. A detailed specification is listed with each model shown. * Please see terms and conditions for additional information regarding installation. If your post home is out of area please get in touch to receive a quotation for fitting.